One summer’s day in AD 122, a quinquereme carrying a Roman Emperor and his Praetorian Guards sailed up the Tyne. His legacy, Hadrian’s Wall, established the area as a militarised zone – and the North East of England has been ‘a seat of Mars’ ever since. When the Kingdom of Northumbria emerged after the Romans left, the region continued to define itself as a contested ‘debatable land’ where military service was a fact of life; first to repel the sea-borne invaders from Scandinavia, and then as the frontline in the centuries of conflict between the Kingdoms of England and Scotland. This has left an indelible physical imprint on the region, and Northumberland remains the most fortified county in the British Isles – in Niklaus Pevsner’s evocative words ‘rough are the winds, the moors, the castles, [and] the dolerite cliffs by Hadrian’s Wall’. To what extent all these battlements and ramparts have helped shape the identity of the North East has long fascinated me. To understand this martial culture it is useful to locate the career of the armaments tycoon Sir William, later Lord Armstrong at a pivotal point in the history of the region. 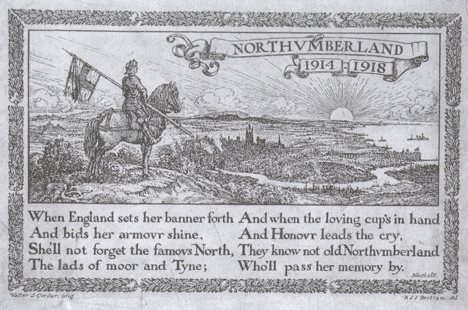 A period when the instability of Border warfare is brought to a close, and Northumbria is finally, fully integrated into the United Kingdom at the same time as its northern neighbour – but before the industrial warfare of the twentieth century, in many respects the apogee of Northern arms and the culmination of centuries of martial tradition, when the men of Tyneside took up arms with greater enthusiasm than any of the nation’s other great conurbations. Even now, from Salisbury Plain to Sangin, Geordies will still be found under the Queen’s colours in disproportionate numbers. Most will still be tempted to credit this to a depressed regional economy whose only consistent export has been cannon-fodder for the British Army. There is much in this, but the deep-rooted martial traditions of the North East, and its hyper-masculine culture – that was shaped as much by William Armstrong as the Border Rievers – can provide us with a richer and more satisfying explanation. For the peoples of the medieval Northern Marches, Tony Pollard has written of the ‘ clearly recognised and accepted obligation on the people of North Eastern England to contribute to the defence of the border’, and within such a militarised society a successful military career was the most likely route to advancement. Northern levies were a staple of English armies and distinguished themselves at the battles of Neville’s Cross, Towton, and Flodden Field where, under the banner of St Cuthbert, the billhooks of the Northumbrian infantry sliced through the long pikes of the Scottish schiltrons. Such experience was deep seated, and celebrated in local culture. 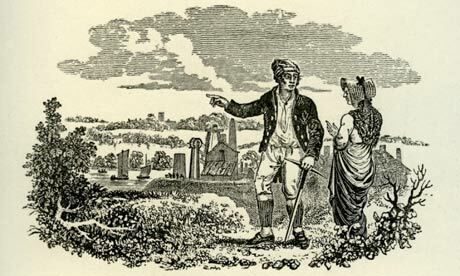 Indeed, Daniel Defoe would observe in his tours of the region that ‘here is abundant business for an antiquary; every place shows you ruined castles, roman altars, monuments of battles, of heroes killed and armies routed’; and Anthony Goodman has written that the people of Northumberland ‘prided themselves on being different from other English folk, and projected their menfolk as a warrior elite’. This was further bolstered by the infamy of the so called Border Reivers – the tough bandits that roamed the ill-defined border. George MacDonald Fraser noted that these men ‘made excellent soldiers if disciplined, but the raw material was wild and hard to tame’. The Pax Hanoveriensis ushered in a period of stability and prosperity for Tyneside. 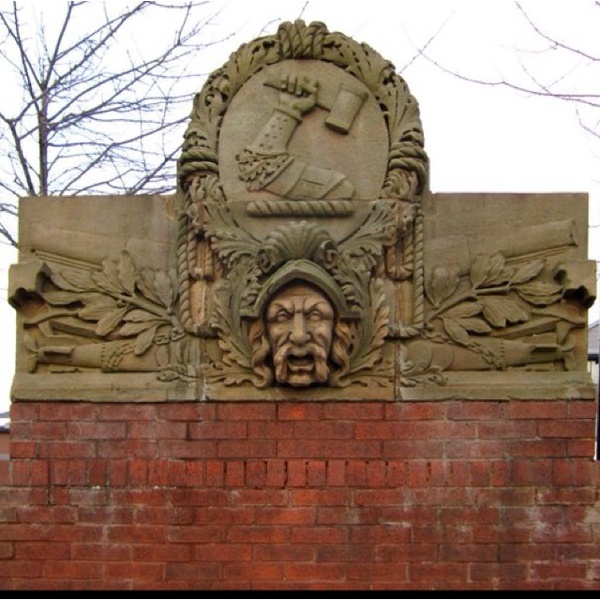 It was property developers, and not invading armies that finally breached the town walls, and the old castle was replaced as the town’s military strongpoint by permanent modern barracks north of Gallowgate in 1804. Yet despite this stability, the war-like instinct remained potent, and during the Napoleonic wars Northumberland had the highest proportion of men volunteering for military service in England at a staggering 75 per cent (greater even than Kent), and only London supplied more men for Nelson’s Royal Navy than the towns of North and South Shields, Newcastle and Sunderland. Throughout the early nineteenth century troops were regularly dispatched North to fight pitched battles with riotous keelmen and miners. It seems fitting then that alongside coal mining, this war-like area should also become famous for the manufacture of armaments. William Armstrong, the Newcastle-born solicitor and gentlemen inventor (with a classic Border Riever surname) had seen an opportunity to apply his rigorous scientific mind to the pressing problems of unreliable artillery. The catalyst for this change, as so much in British military history, was the debacle of the Crimean War – particularly the battle of Inkerman where cumbersome field guns had almost led to a British defeat. In the 1968 film, The Charge of the Light Brigade, the permanently befuddled but gentlemanly British commander Lord Raglan (played by John Gielgud) bemoans the rise of the professional officer – exemplified by the idealistic Capt Nolan – and wistfully remarks to his aide “heaven help us when the British army is run by men who know what they’re doing … It smacks of murder”. William Armstrong certainly knew what he was doing and set about developing a new maneuverable breech-loading field gun. He had commenced firing trials by 1856 and his own backyard of Jesmond Dene soon echoed to 18lb shells slamming into its steep sides. His prototype impressed the government (and even the hidebound Duke of Cambridge observed that “the Armstrong gun could do everything but speak”) and soon the orders flooded in. After a sticky period with the war office, to whom he surrendered his patents in an act of patriotism that earned him a knighthood, he turned his priorities towards naval armaments and the arming of any government around the world who could afford his products. He supplied both sides in the American Civil War, and built battleships for any nation eager to expand their naval power – the Italian warship Europa took delivery of a 100 ton gun in 1876, and at the Battle of the Yalu River in the Sino-Japanese War in 1894 Armstrong ships fired on and sunk each other. Indeed, the Japanese crews of Armstrong-built cruisers even appeared on the St James’s Park Terraces after annihilating the Russian fleet at Tshushima in 1905. Between 1868 and 1927 Armstrong’s company was responsible for 42% of all British warship production – from the daintily rigged Victorian ironclads to the all-steel behemoths of the twentieth century. Armstrong had helped establish Tyneside as an industrial powerhouse as well as a coal exporter. 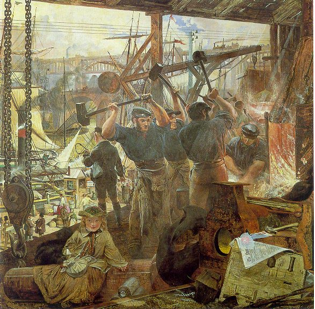 The Newcastle Chronicle had noted with pride that ‘Tyneside has become one of the world’s greatest centres for the production of weapons of death’ and from the 1880s it was the only place in the world where a battleship could be built and armed from scratch on one site, and the local press understood that the town was ‘most prosperous at times of peril’. When he died in 1900, the black-bordered Newcastle Daily Journal paid him fulsome tribute, but in a thoughtful obituary they noted that he was responsible for both ‘the most wonderful machinery of production’ and ‘the most tremendous machinery of murder’, an that ‘there is something that appalls the imagination in the application of a cool and temperate mind like Lord Armstrong’s to the science of destruction’. Could it be that the normality of such massive arms production influenced the ordinary Geordie’s attitude towards conflict resolution? Certainly the prominence of Armstrong’s insignia and the influence of his industries helped make the connection with the regions martial history. 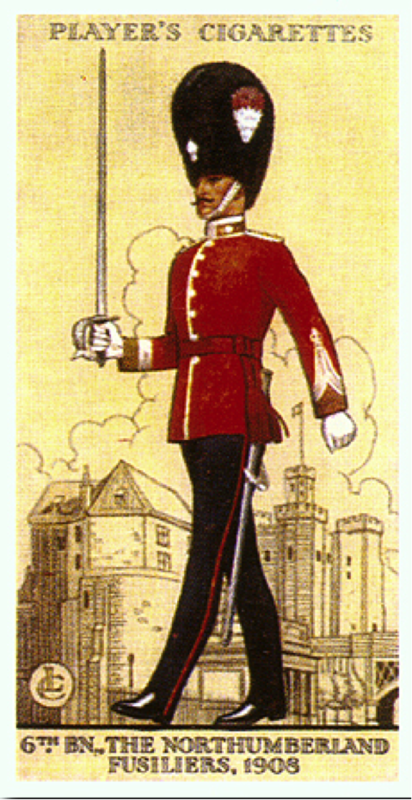 The regimental reforms of the 1860s had had the consequence of making the names of Northumberland and Durham well known throughout the British Empire. (Indeed, in a Study in Scarlet, Dr Watson announces that he has recently returned from Afghanistan where he was serving with the ‘5th Northumberland Fusiliers’.) Nevertheless, for the respectable working classes a career in the ranks was not held in high esteem, and recruitment to those regiments from within a region of high employment was only sporadic in peacetime. Yet, when the Boer War broke out, recruiting sergeants were kept busy in Northumberland and Durham – and prominent “pro-Boer” anti-war Liberals were given a hard time in the khaki election of 1900 by a Tyneside population enthusiastic for war, and the military contracts that it led to. When war came in 1914, no region responded more enthusiastically to Kitchener’s call than the North East. 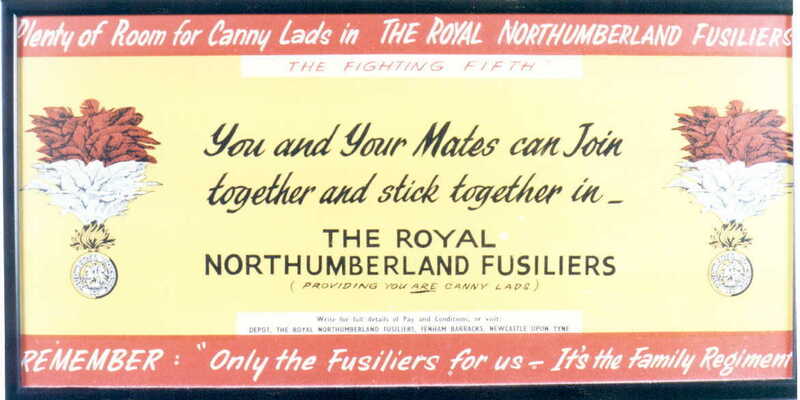 Indeed, by the war’s end the Northumberland Fusiliers alone had an astonishing 51 battalions – a record for the British Army. The response of the North East is interesting because it is inexplicable by economic factors alone. Employment in the region was still relatively strong, and the miners of the Northern coalfield were among the highest paid proletarians in the world. To be sure, many men joined up because life was unremittingly tough, and a spell in uniform had its appeal – as a corporal in the Tyneside Scottish remarked “I didn’t join up out of a sense of patriotism – I was a hand putter and was hewing coal in a two foot seam”. Any visit to Flanders is testament to the North’s contribution to the nation’s butcher’s bill. The badges of the two regiments are ubiquitous, and their names dominate the granite slabs that record the missing at Thiepval and Ypres. (One theory as to why so many North Easterners are listed among the missing is that they wore their army dog tags as they did their ‘colliery checks’ – on their braces, not around their necks). The archetypal ‘digger’ John Simpson Kirkpatrick ‘the man with the donkey’ at ANZAC cove, was actually born and raised in South Shields, and its surely fitting too that the largest British cemetery on the western front is named Tyne Cot, after the Geordies who fought there and thought the German redoubt looked like a pitman’s cottage. Their sacrifice was massive (the small borough of Tynemouth alone lost 1,700 men killed in WW1, with many more wounded), but we have been lulled into thinking that it was only the war poets who spoke for that generation – Gary Sheffield’s revisionist work has shown how many men actually enjoyed trench warfare, as much as the camaraderie of military service. In the years that followed, it was economic exigencies that account for the full muster rolls of local regiments in the 20s and 30s, but the martial DNA of the region was deep-seated (and it was noted that even the men of Jarrow marched in step with military precision). Between 1914 and 1918 Armstrong’s works had contributed 13,000 guns, 14 million shells, and 47 warships to the war effort. This had helped to establish Tyneside’s ‘arsenal economy’ which produced over half of the four million tons of shipping that won the battle of the Atlantic in the Second World War. 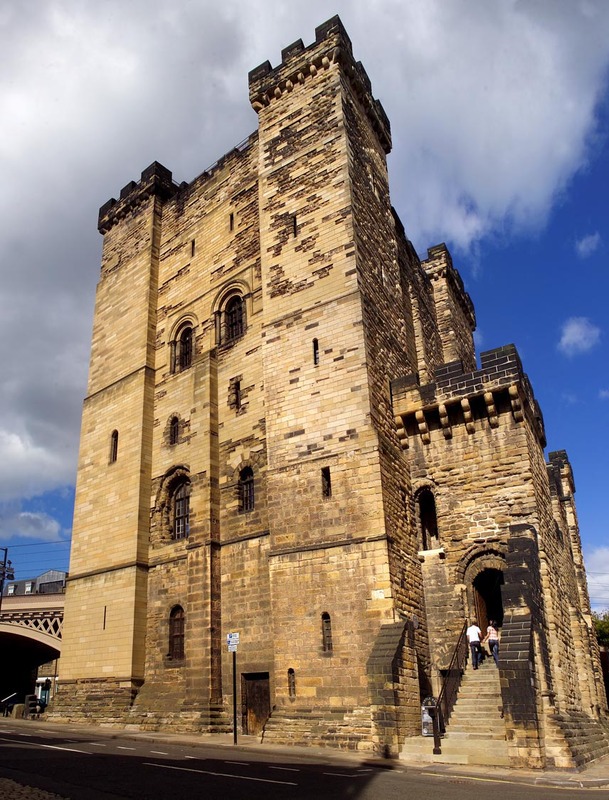 And just like in the Napoleonic period Newcastle was the first city in Britain to bring every territorial unit within its boundaries to double wartime strength, and Northumberland became the first county in England to attain this distinction. The conventionality of military service for North Eastern men endured into the post war period. Geordie Doran, one of the legends of the early SAS started life as a Tyneside ship’s caulker – ‘red hot, hard work which soon built muscle and toughened sinew’ – and he recalled that life in the regiment in the 60s was dominated by ‘Geordies, Jocks, and Scousers.’ Indeed, in 1972, the Newcastle Evening Chronicle noted that of of the first 200 British casualties in Northern Ireland, twenty were from the North East (despite the region only having one twentieth of the UK population). In Stanley Kubrick’s film Full Metal Jacket a leading character, dubbed ‘Private Joker’, is asked why he volunteered; to which he replies: “I wanted to meet interesting, stimulating people from an ancient land … and kill them.” This found an uncomfortable echo for the men of the Royal Northumberland Fusiliers, who teamed up with the Argyll and Sutherland Highlanders in Aden to terrify the local population (amid accusations of Geordie and Glaswegian brutality) – and it was no surprise that the successors of these same two regiments were in the vanguard of the 2003 invasion of Iraq. Thus the martial traditions of the region are undoubtedly deep-seated, and have crystallized into something of a popular stereotype – with programmes like Soldier, Soldier, the Likely Lads, Alan Partridge and the movies Dog Soldiers and War Horse all including representations of the typically ‘up for it’ Geordie squad die. I would argue that a simple economic analysis of Geordie over-representation in the armed-forces is not enough, instead we need to understand the cultural ‘longue durée‘ of the region (nicely represented by a piper from the Royal Regiment of Fusiliers wearing the Northumberland plaid – the oldest tartan in these islands – at their recent homecoming to the North East). In William Bell Scott’s well-known series of murals at Wallington, alongside depictions of Roman conquest and border warfare, a group of Tyneside workmen are shown wielding their quarter hammers like medieval men-at-arms – while in the foreground lies an Armstrong gun barrel and shell (despite the opposition of Scott’s pacifist patron). It was actually sledgehammers and raw muscle that moulded Armstrong’s first gun barrels – and the legend “see what the Northumbrians can do with iron and coal”, speaks romantically of conflict, heroism and the depth of the warrior tradition in North-eastern culture. No less romantic is Augustus John’s moving ‘The Response, 1914’ a portrayal of the Northumberland Fusiliers as they marched down the Great North Road before embarking for France. John perfectly captures the most enduring themes in North Eastern history: the unashamed masculinity, the easy transferability between dangerous work and life under shell-fire (and the necessary solidarity that involved), and the grit and stoicism of the peoples of the North East.